I’m really proud of myself, you guys, because I brought coffee, breakfast, and lunch to work everyday this past week. It’s a huge deal for me because I had grown accustomed to buying coffee and lunch everyday (I would buy coffee or soy lattes twice a day most days) and either skipping breakfast or eating junk from the cafeteria. So, here’s what I know about myself: while I don’t mind leftovers, I don’t want to eat the same thing for lunch and dinner for a week, which is pretty much what happened when I made the pasta bake, and I still had some left after that. In order to keep this up, my challenge will be to prepare and plan ahead so that lunch can be easy and not boring. I’d like to note that if I was eating this at home, I would have added some onion, but I didn’t want to offend anyone with my onion breath. Also, hot peppers or red pepper flakes would be a nice addition to this. First, I had to make sure to press a block of tofu. I put my tofu in the TofuXpress before going to bed one night. 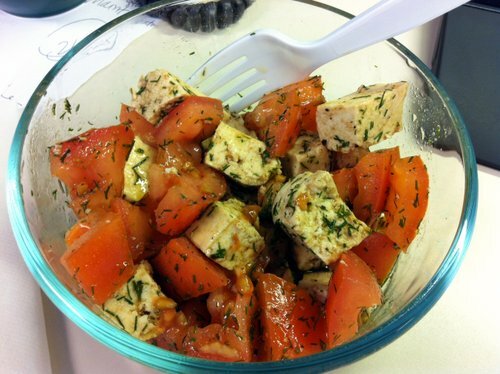 Then, the next night, I drained it, cut it into cubes, and put it in a bowl with the chopped tomatoes. Then I mixed in the olive oil, balsamic vinegar, dill, and salt and pepper. I then placed all of it in my lunch container and put it in the fridge. In the morning, I grabbed the container, put it in my reusable lunch bag, and took it to work. All I had to do when it was lunchtime was grab a fork and chow down! I’ve never been able to eat TOFU. It just doesn’t work for me. The big mistake people make when trying tofu for the first time is not pressing it. The texture is mediocre at best if it isn’t pressed. Marinating it is also important: press for a couple of hours, marinate for an hour, press for 20 minutes and/or cook. EAT!